Brink’s selection of wiring kits consists of universal and vehicle-specific wiring kits. Brink recommends you always get a vehicle-specific wiring kit, as the current generation of cars has been equipped with complex digital systems. A universal wiring kit will not support these systems. A vehicle-specific wiring kit will. Unlike universal wiring kits, vehicle-specific wiring kits by Brink do support the current complex digital systems of your car. They can be connected to the car electronics and are programmable through the on-board computer. Brink offers vehicle-specific wiring kits for almost every type of car, both with 7-pin and 13-pin sockets. Our universal wiring kits can be installed in nearly every vehicle. The kits can transmit signals related to the tail lights. Because these are analogue signals, a universal wiring kit cannot be programmed and can therefore not connect to the on-board computer that controls the car electronics. Brink offers standard 7-pin and 13-pin universal wiring kits. A universal wiring does not support or badly supports many (safety) functions of your vehicle. In addition, when installing a universal wiring kit, problems can arise that require additional expertise from the fitter. The fitting instructions only lists standardized procedures, so whether a universal wiring kit can be successfully installed depends on their skill and experience. Various sockets can be fitted on a towbar. Brink offers the two standard sockets: 7-pin and 13-pin. The 7-pin connection is perfectly fine if you only want to attach bike carriers, trailers, boat trailers or horseboxes to your car. It is an open system, meaning water can get in. We would, therefore, advise that the connection will last longer if you regularly ensure the drain holes of the socket remain open so the drainage system keeps functioning. You need a 13-pin connection if you want to attach a caravan. A caravan requires more electrical power than a bike carrier, trailer, boat trailer or horsebox, for caravan accessories such as inside lighting, the refrigerator and the water pump. These applications cannot be powered with a 7-pin system. The 13-pin socket is waterproof and lasts for years, thanks to rubber sealing on the inside that prevent the intrusion of fluids and dirt. Because of this, the 13-pi socket meets the requirements of the strict DIN norm, the only approved system in the car industry. The CAN Bus was introduced in vehicles at the end of the eighties. CAN Bus stands for Controller Area Network Bus and is a computer network that connects all electrical components in the vehicle concerning propulsion (injection, turbo pressure, etc. ), comfort (seat warmer, door locks, etc.) and safety (electrical stabilisation programme, anti-blocking system, etc. ), ensuring they can correctly communicate with each other at every given moment. The connection is made through a twisted cable (Can-Hi and Can-Low) that runs from component to component and ensures that signals are interrupted by external influences. When installing a new wiring kit, the communication with all electronics present in the CAN Bus system needs to be perfectly in order. For that reason, the vehicle-specific wiring kits by Brink have been equipped with advanced CAN Bus modules ever since CAN Bus was brought to market. They will either immediately be recognised by the vehicle or have to be registered manually. Thanks to the software of these CAN Bus modules, the vehicle-specific wiring kits by Brink communicate with the vehicle through the CAN Bus system. This is the only way the electronics of the car can always take the right decisions and respond when it comes to the propulsion, safety and comfort systems, with or without a trailer. We would never have had the comfort, safety and functionality that we expect of modern-day vehicles without CAN Bus. The basic function of a wiring kit is to power your bike carrier, trailer, caravan, boat trailer or horsebox. This also ensures that the brake lights, indicators and reverse lights of the trailer are functioning. A universal wiring kit by Brink provides this. This provision of the vehicle-specific wiring kit by Brink is required for attaching a caravan to the vehicle, as a caravan needs more electrical power than a trailer. For caravan accessories such as inside lighting, the refrigerator and the water pump. Parking sensors register objects in the vicinity of a car. 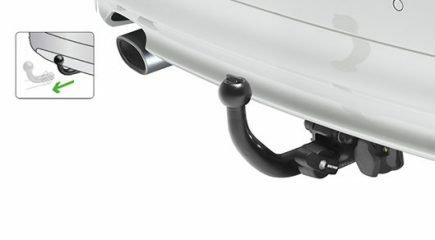 As soon as a trailer, caravan or bike carrier has been attached to a towbar. In most cases, the Brink vehicle-specific wiring kit offers the possibility to deactivate the Park Distance Control (PDC), as soon as the plug of the bike carrier, caravan or trailer is plugged into the socket. More and more often, the PDC can be deactivated by the driver with a switch on the dashboard. In these cases, the Brink vehicle-specific wiring kits do no automatically deactivate the PDC. Lamp substitution occurs if a lamp of the vehicle is defective. The car then automatically turns on a different lamp as a replacement. The Brink vehicle-specific wiring kit supports this function, in order to ensure no loss of lighting on the trailer. Our vehicle-specific wiring kits come with a connection that also controls the fog lights on the trailer, bike carrier or caravan. At the same time, this safety system can also deactivate the fog lights of the car. This prevents the driver from being blinded by the reflection of the light on the trailer or caravan through the interior or side mirrors of the car. Check Control (CC) is a lamp checking system that is used to verify the proper functioning of the rear lights, brake lights, blinkers and/or fog lights of the car. If one of these lights is malfunctioning, a warning is shown by means of a check light, symbol or text on the dashboard. Our vehicle-specific wiring kits support this feature of the vehicle. C2 Control is a system that identifies whether an indicator on the trailer, bike carrier or caravan is defective. C2 Control shows this by means of a visual or auditory notification. This is a mandatory system in Germany, Austria and the United Kingdom. The Brink vehicle-specific wiring kit supports this feature. As of 2014, every new vehicle is required to have the Electronic Stabilisation Programme (ESP). This system detects abnormal movements of a car and immediately corrects them without the driver even noticing. Almost every ESP system can be expanded with the Trailer Stabilisation Programme (TSP). This system ensures that the movements of the car are checked and corrected even more closely as soon as the trailer has been connected to the vehicle. By doing this, TSP prevents a car with a trailer from becoming out of control (known as snaking). As soon as the dangerous swinging of a trailer begins, the system responds within several milliseconds and immediately stabilises the car and trailer. TSP communicates with the CAN Bus of the vehicle and only functions with a vehicle-specific wiring kit. Adaptive Cruise Control (ACC) is a system that is present the newer cars at this time. These cars have been equipped with a radar system that measures the distance to the vehicle in front. Based on this data, the car is able to slow down or brake. This way, anticipating the actions of other cars is a lot easier. A Brink vehicle-specific wiring kit ensures that the system adapts to the additional weight of the trailer as soon as it is attached. However, the driver can always intervene and deactivate the system again. The Anti-locking Brake System (ABS) ensures that during an emergency stop the wheels do not lock and the driver can keep control of the car. Thanks to an option in the system that calculates the additional weight of a towed object, ABS also keeps working as soon as a trailer, caravan or bike carrier is attached to the car. The Brink vehicle-specific wiring kit supports this option in the ABS system. The Blind Spot Identification system automatically issues a warning when an approaching car is in a blind spot, ensuring the driver can confidently change lanes. Thanks to the Brink vehicle-specific wiring kit, the system registers that the blind spot changes position and should shift more to the back as soon as a trailer is attached to the car. The Lane Assist system issues a warning to the driver as soon as they deviate from their lane, thanks to a sensor in the vehicle that registers the road marking. The system works at speeds over 65 km/hour. The driver is notified of the vehicle crossing the road marking through a sound from the speakers, vibration of the steering wheel or a notification on the dashboard. If the blinkers are turned on, the system knows when a driver intentionally leaves their lane. In that case, they will not be notified. The Brink vehicle-specific wiring kit automatically deactivates the Lane Assist system, because the width of the trailer can differ from the width of the vehicle it is attached to. The City Safety system prevents collisions at low speeds. Sensors follow traffic in front of the car within 10 metres and up to 30 km/h. If the driver does not respond to an obstacle in time, the system automatically brakes. A Brink vehicle-specific wiring kit ensures that the system adapts to the additional weight of the trailer as soon as it is attached. Park Assist helps with parking. This system coordinates with Park Distance Control. If a collision with another vehicle is imminent, a warning signal will sound. Park Assist knows three levels. In the first degree, the driver only has to control the throttle and brake themselves, no hands required. The system automatically detects the available space in parallel or reverse parking and independently steers in and out of the space. In the second degree, Park Assist also takes control of the throttle and brake. A Brink vehicle-specific wiring kit automatically deactivates the first two levels of Park Assist, as it is unaware of the length and width of the trailer. The driver will see a notification of this on the dashboard as soon as the trailer or bike carrier has been attached. This will avoid damage. In the third degree, the system will completely independently park the car with the trailer attached. The Brink vehicle-specific wiring kit does support this option.